You could be the person that is lucky enough to win every book you see pictured here. Yup. All 5 of these Historical and Intrigue titles could be yours. Let's find out more about them, then be sure to enter via the Rafflecopter form below. Good luck! Spurred on by their Texas-sized attraction, Dallas and Kate untangle a web of lies that throws the baby's paternity into question. And Dallas wonders—could he be a father? Could he be a husband? But when bullets start flying, the real question is, will he survive to find out? "Ladies unite. Votes for women!" Caroline MacFarlane has one mission in life. The pain she experienced at the hands of her father is numbed when she stands on stage and teaches the world that women are just as strong, rational and capable as men! But when her safety is threatened, suddenly protective sheriff Hawk Rivera is glued to her side—day and night! This unexpected bodyguard has Caroline's life in his hands, and she's surprised to find that Hawk's commanding presence is not just reassuring, but enticing, too. Through his writing, ex-Navy surgeon Warren escapes the memories of cruel days at sea. So when he finds Miss Domville’s music and strength an inspiration, he’s certain the benefits of a partnership with this disgraced beauty will outweigh the risks of scandal…if she’ll agree to his proposal! 2. Open to residents of U.S. and Canada (excluding Quebec) only who are 18 years of age or older. 3. Giveaway hosted by this blog. 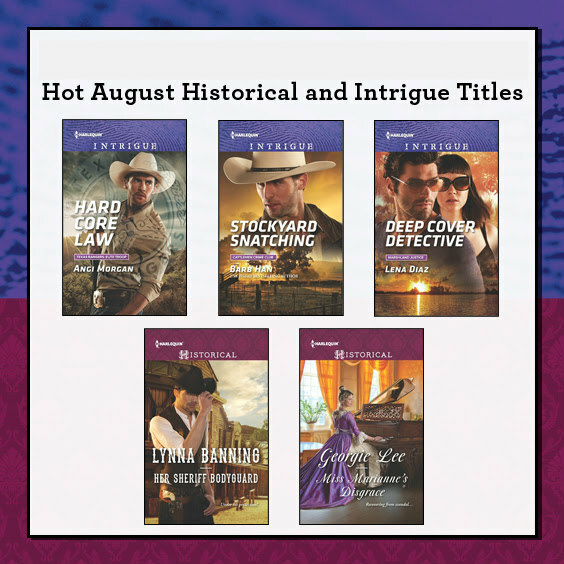 Harlequin will ship directly to the winner. Thanks for a great giveaway. I love getting books. This is a great batch of summer reads! Crossing fingers and toes. Thanks for sharing, Freda! I think I would read Deep Cover Detective first, they all look great! Thanks for the chance to win! I can't wait to read this month's selections!